Rahman Bouzari is a graduate of philosophy who works as a journalist for Shargh Newspaper. His project for the Critical Theory workshop, “How to Neutralize an Emancipatory Movement?,” is an attempt to discover the theoretical interactions between the Iranian protests of 2009 and the Arab Spring. It also seeks to clarify the coordinates of the predicament in which the Arab uprisings, along with the Iranian protests, have been evaporated from the scene of the Middle-East, paving the way for reactionary forces such as ISIS. Dana Chahal is a Lecturer in Academic Language and Learning at Victoria University, Melbourne, Australia. Following a period of teaching Linguistics and researching the Intonational Phonology of Lebanese Arabic, Dana’s interests have turned to the exploration of critical theories in the field of Academic Language and Learning (ALL). Her project for the CTW 2015 is a review article which investigates Critical Theories in the ALL literature, the extent these guide ALL theorization, and the nature of their influence on ALL practice. Jesse Chou is a recent Amherst College graduate. While at Amherst, he studied literature, political theory and the natural sciences. He also spent a semester abroad in Paris studying critical theory and public health. He is glad to be back in Paris for the Critical Theory Workshop and the chance to explore the intersection of social medicine and critical theory. His project specifically will explore the changing conceptions of ‘plague’ through different remediations across texts such as Camus’ The Plague. Natalia Danilkina holds a PhD degree in philosophy (Immanuel Kant Baltic Federal University). She works in the fields of philosophy and sociology. 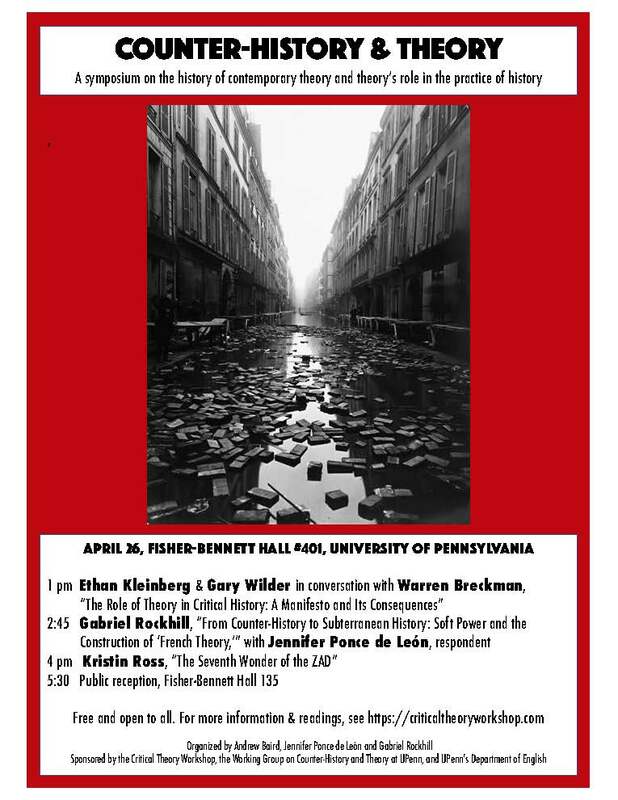 Her project for the Critical Theory Workshop is focused on the interplay between the concepts of “freedom” and “equality” in the Frankfurt School. Anaïs Djouad has an M.A. in hypermedia and communications and is currently registered as a PhD student in the LASCO research center at Université Paris Descartes. Her doctoral thesis uses an interdisciplinary approach, aiming at the convergence of philosophy of technology, sociology of organizations and media science. For two years now she has been working on the formulation of a critical theory regarding the development of the digital workplace, also known as e-management. At the workshop, she would like to develop a writing methodology for the drafting of her dissertation. Chris Drain is a doctoral student in Philosophy at Villanova University. He works at the intersection of philosophy of technology, philosophy of mind, Soviet psychology, and cognitive anthropology. His Critical Theory Workshop project, “Activity and Cognition in Marxist-Soviet Psychology,” corresponds to his initial dissertation chapter and argues that the work Vygotsky, Leontiev, and Luria provides a historical and theoretical middle ground between Marx and Engel’s anthropological insights on the one hand and contemporary work in the “4E” platforms in cognitive science on the other. Nathan Eckstrand is currently a Merton Fellow at Mercyhurst University in Erie, PA, having finished his dissertation on revolution in 2014. His dissertation, “The Event of Revolution: Exploring the Relationship Between the State and Radical Change” discusses the correct way of conceiving of revolution, given how the constraints that are often put on revolution keep it from producing transformational change. While at the workshop, he will be working on turning his dissertation into a book. Alex Feldman is a Ph.D. candidate in philosophy at The Pennsylvania State University and is currently a Visiting Doctoral Student at Université Jean Moulin Lyon 3. He focuses on twentieth-century French and German continental philosophy, with a special concentration on the relationship between Canguilhem’s historical epistemology and Foucault’s analyses of biopower. His project for the Workshop, “Medical Revolutions and Political Revolutions,” corresponds to a part of his dissertation. Paola Gadala-Maria has a B.A. in Philosophy from Villanova University, where she also minored in French and Engineering Entrepreneurship. This past year she travelled to Costa Rica as a co-director for the social justice documentary ONE IS NO ONE as a part of No Trace Films, along with writing and directing her first short film A TOXIC AFFAIR. Her project for the Critical Theory Workshop will combine her recent work in social and political philosophy along with documentary filmmaking in a documentary about the metaphysical and political debate over transhumanism. Owen Glyn-Williams is a Ph.D. Candidate in Philosophy at DePaul University who is working on ‘civil war’ as both a critical concept of state power, and a polemical posture assumed by emancipatory, counter-state struggles. His project, entitled “Civil Enmity,” corresponds to a chapter in his dissertation. Patricia Grosse is a Doctoral Candidate in the Philosophy Department at Villanova University. In her project, “Augustine’s Failed Relations,” she will develop a reading of Augustine’s conception of the intimate connections between self and soul, soul and body, and self and world by closely engaging with Augustine’s early dialogues, especially his Soliloquies (Soliloquia). This project will be a chapter of her dissertation, “Embodied Love and Extended Desire,” which will provide a new feminist analysis of Augustine’s theory of love as a mode of human engagement with the world. Jeannette Hicks is a doctoral student in Philosophy at the University of Guelph, and a member of the Toronto-based installation art collective Tongue & Groove. Her project for the Critical Theory Workshop will explore the implicit historicity of artistic practice sustained by the concept of the avant-garde, with particular attention to the discourse of critical rupture and political emancipation in contemporary participatory art and social practice. Katrina Jaworski is a Senior Lecturer in Cultural Studies at the School of Communication, International Studies and Languages, University of South Australia. Her research focuses on the agency of suicide with a focus on the body, gender and sexuality. Her research extends to the philosophy of death and dying bodies, as well as African genocide, violent extremism, celebrity lives and deaths and the cultural politics of writing and higher education. Katrina’s project for the Critical Theory Workshop is entitled, “Suicide as an ethical gift,” which she will turn into a journal article and which represents the initial stages of her second monograph on suicide. Mark Kelly is Senior Lecturer and Australian Research Council Future Fellow in the School of Humanities and Communication Arts at the University of Western Sydney. His Critical Theory Workshop project, “The Philosophy of Balibar,” represents a formative stage of a projected monograph on Étienne Balibar’s political thought. Robert Leib is a PhD candidate in Philosophy at Villanova University. He is working primarily in 20th Century continental philosophy of language, specifically on the relationship between language, ontology, and community. His project for the Critical Theory Workshop aims to place Jean-Luc Nancy’s work on community within the wider context of contemporary Francophone thought. Marcin Leszczyński is a doctoral student at University of Łódź, Poland. His major interests are historiosophy of science and epistemology, at the intersection with social sciences and jurisprudence. He hopes to elaborate on the notion of time in Foucault’s oeuvre, which will provide him with an idea of how change can happen in an ontological sense. Paul McQuade is a PhD candidate in the Department of East Asian Studies at Cornell University, where he specializes in modern Japanese literature and literary criticism. His project for the Critical Theory Workshop, “Troubling Exchanges: Translating the Socius in Tanigawa Gan,” puts the theoretical work of the poet-activist Tanigawa Gan in dialogue with contemporary issues in Marxism and translation theory. Gustavo Quintero is a PhD candidate at the Romance Studies Department at Cornell University. He holds a B.A in Literature from the Universidad de los Andes, in Bogotá, Colombia and a M.A in Romance Studies from Cornell University. His research interests focus on studies on Messianism and Marxism in Mexico, Cuba and Colombia, but also on contemporary French theory, in particular theories of finitude. Currently he is translating into Spanish some texts by Jean-Luc Nancy and the book Unclaimed Experience: Trauma, Narrative and History by Cathy Caruth. Charlie Strong is a graduate student in Philosophy at Villanova University who is working on the related concepts of habitus, habit and second nature from complementary perspectives in critical sociology, embodied phenomenology, technology studies and philosophy of mind. His project for the Critical Theory Workshop, entitled “Artifact, Habitus, Habitat: The Role of the Built Environment and Everyday Technologies in Perception, Apperception and Action,” corresponds to a chapter in his dissertation. For more information please click here. Christina Virok is an educator and master’s degree candidate in the department of History at Villanova University. Her area of concentration is early and high medieval France and England. Her project for the Critical Theory Workshop, tentatively entitled “Radegund’s Voice,” explores the lasting influence of Radegund of Poitiers on the political and spiritual landscapes of Merovingian Gaul. The research for this project will form the basis of a scholarly article. Dan Wood is a doctoral student in philosophy at Villanova University in Philadelphia. His project for the Critical Theory Workshop is entitled, “The Relevance of Cabralist Revolutionary Politics for Contemporary Critical Theory.” This project will be an introduction to two of Cabral’s works, “Análise de Alguns Tipos de Resistência,” and “La rôle de la culture dans la lutte pour l’indépendance,” both of which will be part of a forthcoming book entitled Resistance and Decolonization. For more, click here.